During my interview for Facebook, I was asked to propose ideas for improving Page creation flow. This part of the UI hadn't been updated in years, and it showed. The dropdowns felt really long, and they didn't show the most useful categories. 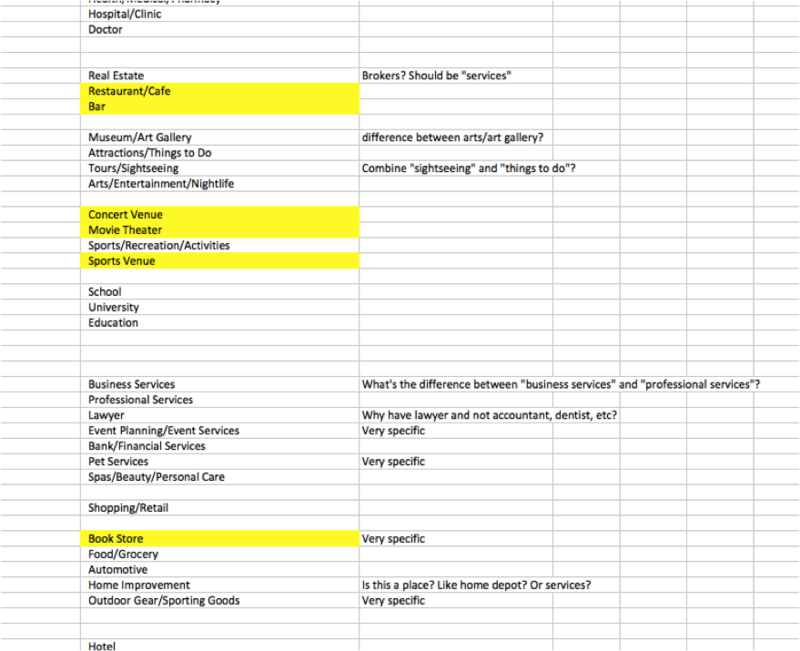 There was also a lot of overlap between different concepts: For example, how are business owners supposed to know if they're a "local business" or a "company"? I saw that the taxonomy had major issues, and that any design improvements would have to take that into account. The taxonomy problem kept nagging at me. As the content strategist for Facebook Pages, I decided to see what I could do to to improve the create flow. My hypothesis: Making the taxonomy simpler would improve the user experience for admins, and it would help make their Pages more findable. Overhauling categories was a big undertaking with a lot of technical complexity. No one I talked to was keen to start from scratch. Based on this, I summarized the issues in a presentation and shopped it around until I found an engineering team that I could partner with. 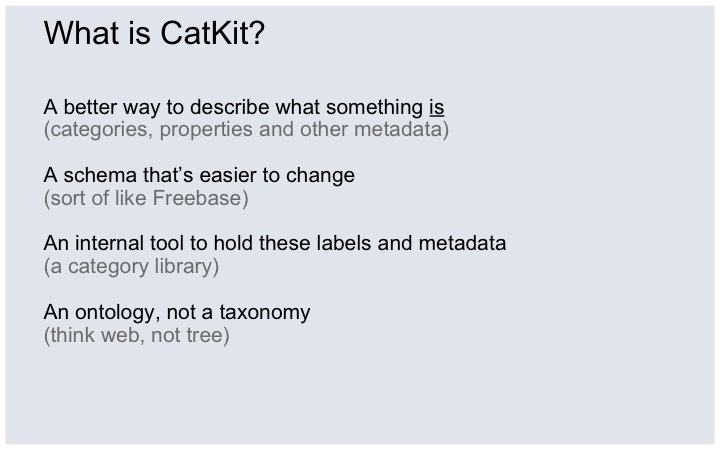 We called the project "CatKit." We started by trying to define the project goals and requirements. This involved a lot of worksessions, whiteboard diagrams, and post-its. I then gathered up all the different categories used on Facebook. The spreadsheet felt unwieldy, so I printed out all the categories on cards and tried organizing them into groups. It was fun, but it only got us so far—there were too many to deal with. - Creating a new version of the category content management system. At the end of the project, I delivered a spreadsheet outlining the proposed categories and migration plan. While I felt really good about where we landed, it's quite complicated to implement these types of changes, and as of today our recommendations aren't up on the site. Who knows, maybe they'll get to it one day! 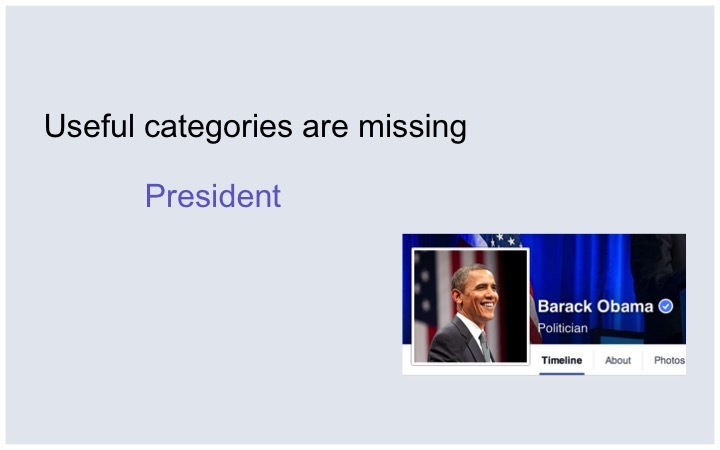 Make it easier for people to create a Facebook page and choose the right category for their business or organization. 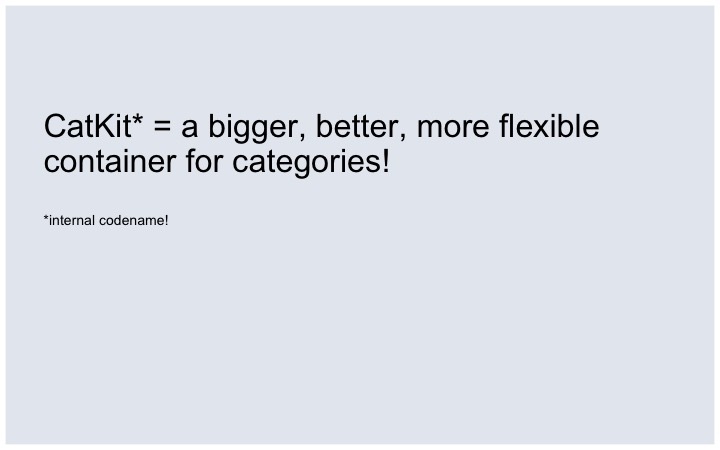 I led the effort to propose a new taxonomy for Facebook Pages.